It’s holiday time down in Armadillo Acres (North Florida’s premier mobile-living community), and everyone’s filled with warmth and beer. But when a freak bout of amnesia strikes the trailer park Scrooge, neighborly love is put to the test. Be on hand as Betty, Lin, and Pickles jingle all the way with some new neighbors in an all-new, all-trailer-park musical! This outrageous sequel to the original THE GREAT AMERICAN TRAILER PARK MUSICAL is just as much of a cat-fightin’, sun-worshippin’, chair-throwin’ good time – but with tinsel and Keg Nog! SPECIAL NOTE for The Great American Trailer Park Christmas Musical: SAT DEC 8 performance is 2PM only. There is no 8PM performance. Doors open at 1:30PM. SAT DEC 15 has 2 performances; 2PM & 8PM. TWF 2018-19 Season subscriptions on sale now! Save 15% on all 3 fantastic musicals! The Great American Trailer Park Christmas Musical single show tickets on sale July 30, 2018. Please check back here for online ticket link. 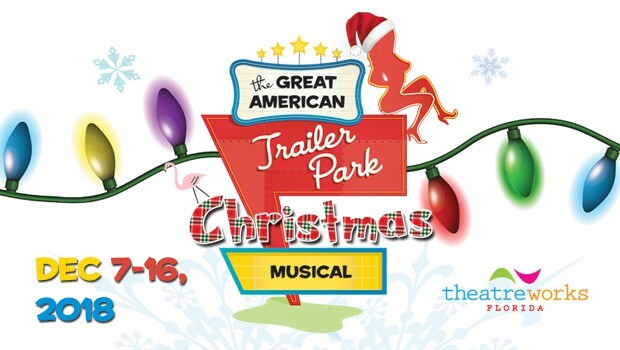 THE GREAT AMERICAN TRAILER PARK CHRISTMAS MUSICAL is presented by special arrangement with Dramatist Play Service. Polk County’s ONLY professional, award-winning theatre!